Over the past few months, whenever I got time off work, my mother dragged me off to the old family jeweler to pick up pieces for my wedding trousseau as tradition demanded. Having served four generations of ladies in our family, the jeweler automatically brought out pieces that they were naturally inclined to prefer. Apart from an occasional nod or a look of delight or disapproval, there was not much for me to do as the final decisions were taken by my grandmother and my mother. I sat there casually flipping through a bridal magazine, leafing through pages of quintessential cuts and elaborate designs, nothing of which my grandmother would approve of because they weren’t part of a “set”. For instance, the French style Cocktail ring and the heart shaped ruby studs would not be paired with the vintage styled gold necklace and bangles that was picked up at the jeweller’s and would not, like in the grand tradition of bridal jewelry, rest peacefully in a bank locker after been flaunted off for an evening. From what seemed like an eternity of shopping for my wedding next year, my birthday silently crept up on me. With the shopping trail behind us, I decided to kick in the heels and chuck the upcoming birthday out of the window. I told my mother that I would stay in and pamper myself with bath salts and chocolates. Soon, a gift bag arrived with a box of truffles! My mother knew I loved truffles as much as I loved jewelry and the fact that I was pretty much giving in to her choices when it came to the wedding shopping, I felt a deep sense of bliss surging through me as I ripped open the 1 kilo pack of chocolate truffles. Apart from the delicious treat inside the box, something else glittered and I was completely stumped for a minute. 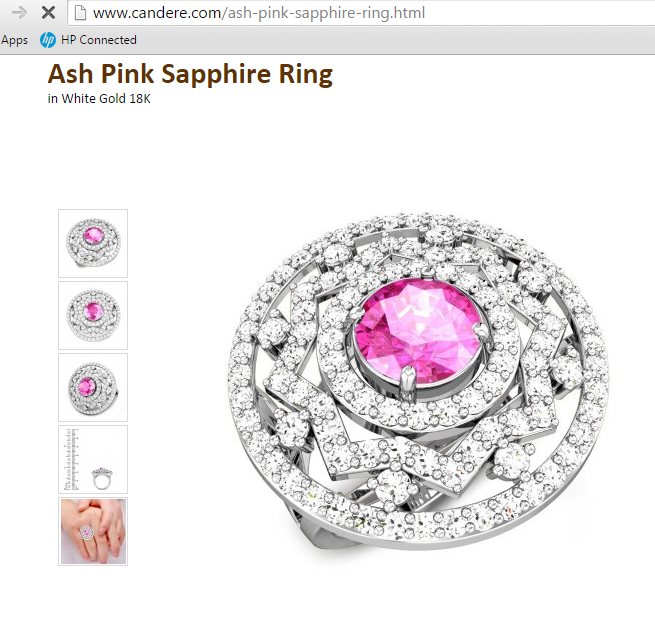 It was a beautiful Ash Pink Sapphire Cocktail diamond ring in white gold my mother had got for me from Candere, an online jewelry store. Their sizing guide was perfect and it slid in and rested snugly around my finger. It was dazzling and bright and a complete, visual delight! 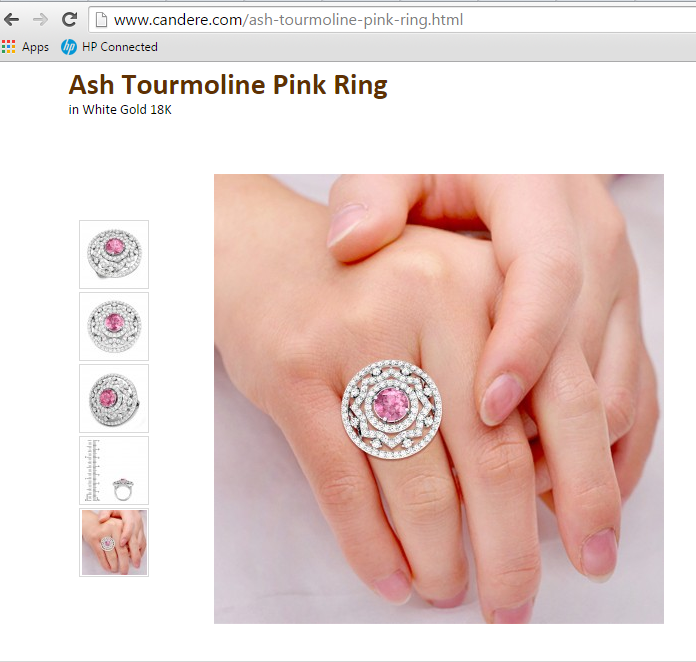 My mother was somewhat apprehensive about buying diamond jewellery online but what put her at ease was that Candere’s products come with Insured free shipping, Jewelry Certifications and Lifetime exchange. So there it was my new Cocktail ring that I absolutely loved and was mentally planning a suitable outfit to complement the elegant and brilliantly cut, irresistible piece of jewelry on my finger. I went online to check out what the store had to offer and was completely taken in by their luxurious designs and clean cuts. I mentally made notes to order something for my grandma’s fiftieth wedding anniversary and the best part was the USP of the product is its bespoke international designs and it is also available on EMI! It didn’t take me long to make up my mind and proceed to check-out.